As an Oregon farm boy growing up in the 1930s and '40s, Kenneth Magee wanted to give the best he could to God. His motivation led him to study medicine, and through his years of medical service, Magee sought to work for the Lord. But what he didn't expect was just how far God would stretch him. 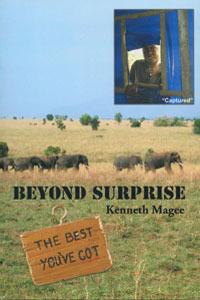 Beyond Surprise shares Magee's life-altering experiences of practicing medicine not only in the United States, but overseas in battle-scarred countries and disaster areas. Working with people of varying faiths and backgrounds as part of Medical Teams International, Magee visited some of the poorest nations on Earth. Each journey showed him the importance of listening, maintaining a sense of humor, and hoping in the decency of mankind. From war-torn Iraq and Afghanistan to poverty-ravaged El Salvador and refugee camps in Liberia, Magee helped people regardless of age, nationality, race, or religion. He listened to a woman named Nergis explain her frightening flight from Saddam Hussein; aided a terrified mother with her infant in tsunami-ravaged Sumatra; endured the torrential rains of Uganda; and enjoyed the simple pleasure of petting a black lamb in an Afghani sheep camp. Beyond Surprise shares the remarkable true story of how one man's faith gave him a lifetime of hope in God's goodness.